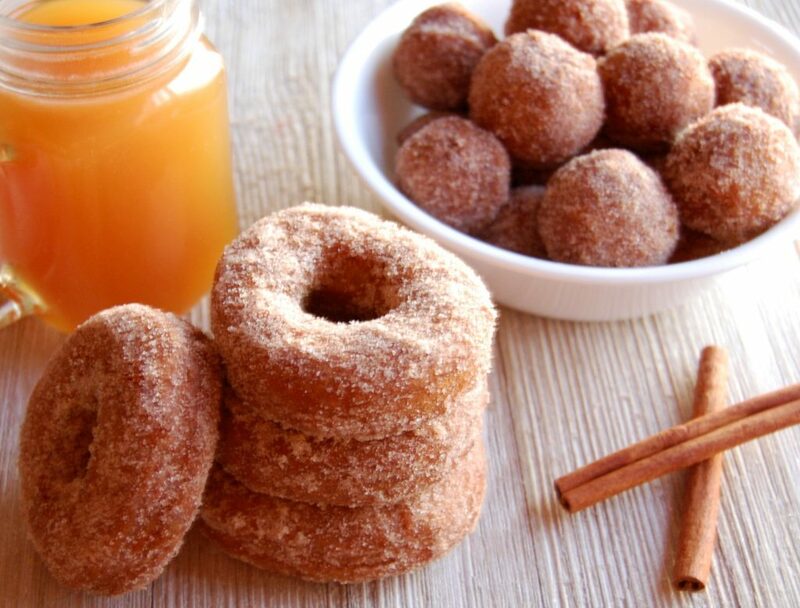 What could be better on a cold, crisp, Fall morning, than a cup of hot coffee and warm apple cider donuts? CINNAMON-SUGAR: In a shallow bowl, mix 1 cup sugar and 1 tablespoons ground cinnamon. Toss with warm doughnuts; set aside. DONUTS: In a small saucepan, bring cider to a rapid boil; cook over high heat until reduced by half, about 10-12 minutes. Cool completely. In a large bowl, whisk together flours, brown sugar, baking powder, salt, baking soda and spices. In a separate bowl, whisk eggs, melted butter and cooled cider; stir into dry ingredients just until moistened (dough will be sticky). Refrigerate, covered, for 1 hour or until firm enough to shape. In an electric skillet or deep fryer, heat oil to 325 degrees. Fry doughnuts a few at a time, until golden brown about 2-3 minutes on each side. Fry doughnut holes, a few at time, until golden brown and cooked through, about 1 minute on each side. Drain on paper towels; cool slightly. 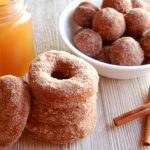 Roll in cinnamon-sugar or dip tops of doughnuts into glaze of your choice. Yields: 1 dozen doughnuts plus doughnut holes.